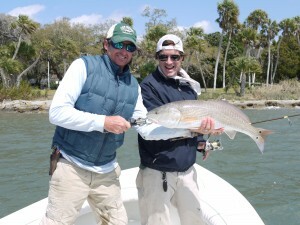 Captain Tom Stephens with Redfish and J.P.A. Opening reception 5-11 p.m. Fri., March 26, exhibition runs through April 25, G.WIZ Science Museum, 1001 Boulevard of the Arts, Sarasota, topnotchfishing.com, tomstephensfineart.com, sartq.com, free. As he does on most days during the summer months, Captain Tom Stephens Jr. paces the deck of his 23-foot Dorado fishing boat docked behind New Pass Grill. He checks the rods, stocks bait and frees a pelican caught in a line. I probably resemble most of Stephens’ clients as I board the vessel with an itch to get fishing. The breeze is brisk as we make our way along south Longboat Key into Big Sarasota Bay. Stephens ascends to his perch to survey the shallow waters and soon locates a swirling school shimmering in the grassy flats. Anchor down — this is where his process begins. A member of the local contemporary artists’ collective S/ART/Q, Stephens displays his latest work at the group’s new exhibition, opening at G.WIZ this weekend. Appropriately titled Process, the goal of the show is to give art lovers a glimpse into the creative process artists go through from inspiration to installation.